Notice all of the lines are receding into one point. Make a drawing using a 3 inch box. 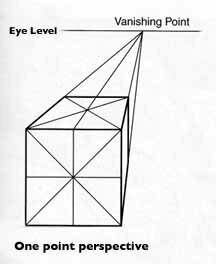 Notice in this drawing that that all the lines are receding into 2 points make a drawing using a 3 inch square for this drawing also. Tools: T-square, triangle, ruler and pencil. After this exercise make a free hand drawing from a setup of two boxes in the same drawing. it really helped me with my drawing!